Since the beginning of time…time has been that companion keeping us grounded and stable. We know what we need to do…because of time. Without it, we’re lost. Why do you think clocks were invented? Makes sense. 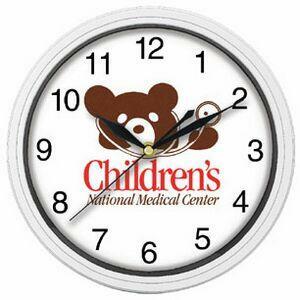 However, when we’re pretty much contained in an environment like a children’s hospital, it’s not so much about telling time as it is about looking forward to something: like seeing family, or getting a treat, or a visit from a celebrity. A branded clock? That does it so much better than any digital readout! They’re not just looking at numbers. They don’t just tell the time. They can see that there’s something to look forward to: and it’s because of you. The nurse. The doctor. The hospital. The care they get. Whether it’s cancer treatment, or a slip and fall. Surgery. You name it. That’s the real treatment beyond that of bandages and medication. We’ve got to say, we’re missing that these days! Everyone’s gone digital, but the classic clock face is so nostalgic and making for a great message to give. Something you don’t get from digital. That’s why you can brand your clock design with whatever name or logo you want. At a children’s hospital, just sayin’: that’s gold to a patient. Something even Patch Adams would approve of. BRAVA Marketing has so many designs to choose from. So many different styles. It’s really all up to you. Don’t think that the placeholder designs you see are what they’re going to be. Really, you can choose anything and then brand it with anything you want. It’s completely up to you. Then contact us when you find exactly what you need. Let’s just say it’s our way of treating you — so you can treat your patients in the best way.